On September the 27th 2007 has been put into operation the biggest photovoltaic plant with solar trackers ever realized in Italy, with nominal power of 999,80 kWp. The plant named "San Michele" is situated in Santa Croce Camerina in the province of Ragusa, and has been designed and realized by TecnoProget Engineering s.r.l. The plant has been financed with private funds, and has been admitted to the first «Conto Energia» ("Energy Bill") issued in 2005. 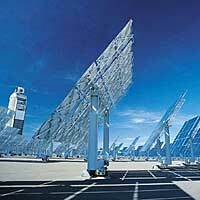 The "San Michele" plant is placed first in Europe for the production of photovoltaic energy per installed kWp. From the first data has emerged, in fact, that the plant has produced approximately 7500 kWhs a day and it has been estimated that it will have an annual production of 2.100.000 kWhs as foreseen by the design engineers of TecnoProget Engineering. This exceptional result is obtained thanks to the sum of many factors, but surely the choice of the solar trackers has been decisive to reach the set objectives. Just consider that Germany, leader in the photovoltaic sector, has an average production of 900 kWhs per installed kWp against the 2100 kWhs per kWp that the "San Michele" plant will produce. The plant has a size of 4 hectares and is composed of 4650 photovoltaic panels fixed on 155 solar trackers that have been designed, tested and patented by TecnoProget Engineering. The design engineers of TecnoProget Engineering can be complimented on this brilliant result, because now the firm can boast a unique know-how that places it among the leading firms for the design and construction of photovoltaic plants of big size and very high production.